TPMS specialists, Tyresure Ltd, have announced that they will be exhibiting at the upcoming Automechanika show in Birmingham, and are looking forward to demonstrating their comprehensive TPMS product range to customers from Hall 20, Stand E80. The exhibition will take place at the National Exhibition Centre (NEC), and will run from the 6th – 8th June 2017. Tyresure are planning to exhibit their complete TPMS line at the event, including their universal T-Pro sensor range which covers over 90% of TPMS-equipped vehicles, as well as OE-R replacement sensors, diagnostic tools, TPMS valves, service parts, and accessories. Tyresure are also looking forward to launching some significant new additions to their product range, which they will be introducing to customers for the first time at the event. 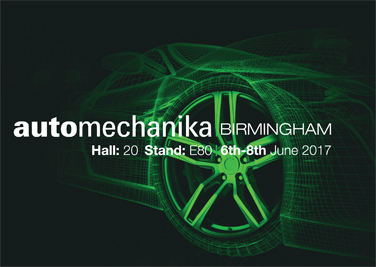 For the Tyresure team, the Automechanika exhibition is a valuable opportunity for the business to demonstrate the quality of its products, raise awareness about the importance of TPMS and servicing sensors in the UK market, and demonstrate their latest product developments. Tyresure will also be sharing their stand with their partner company and global TPMS manufacturer, Hamaton, therefore allowing them to present an even wider selection of TPMS products to customers. For a conversation with one of Tyresure’s representatives, visit the team at the Automechanika exhibition in June - where they will be located in Hall 20, Stand E80.